One of my areas of collecting is that of Jizai Okimono or articulated creatures. Life-size and very detailed, these creations take the form of insects, shellfish, dragons, snakes and other animals. Materials range from ivory, to silver, copper, iron, bronze, shakudo and other metals, with legs, wings, heads, etc. being completely moveable. Examples can date as far back as the Edo period, but most are from the Meiji or Taisho periods. I am actively seeking fine examples of jizai okimono, especially insects in iron or bronze. Please drop me a PM if you have any such items for sale. Wow, that is a pretty niche hobby. Don't have any sources for you, but I'm sure we'd all be interested in seeing what you've got. Assuming you're willing to share pics. Will try to post an image by the weekend. Sorry it took so long, but I had to remind myself how to post an image - Hopefully it works. 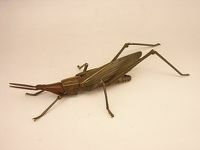 This is a late Edo/Meiji period grasshopper in bronze, signed by the artist Muneyoshi. Once samurai were outlawed, armorers started to make these lifelike, articulated creatures to show their craftsmanship.